The 10 things I learned making a short film that took 10 years to make that I finished 10 years ago. Ten years ago, in 2009, I finished an 8 minute hand animated film called ‘Leonardo’. 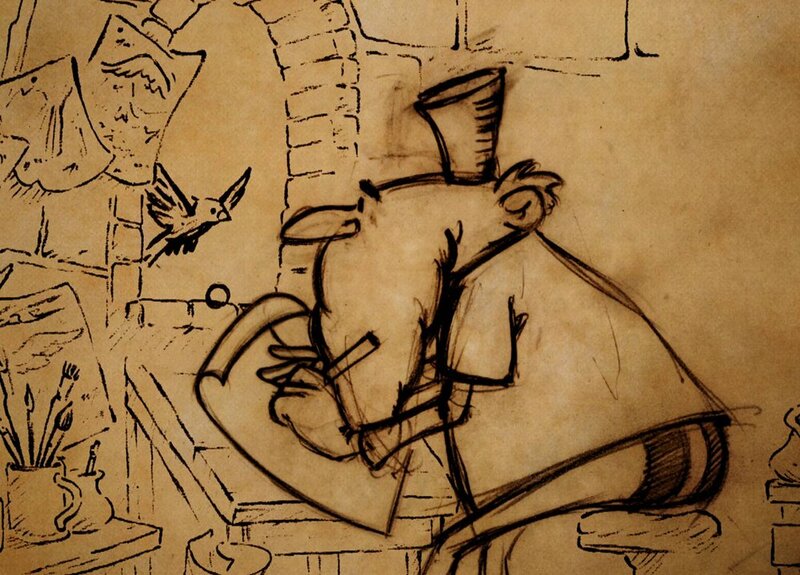 The short is about Leonardo da Vinci and his journey, in a way, through creativity. Dedicating weekends and stolen time between my job at Pixar Animation and raising a family it took 10 years to finish the film. I documented the making of, or I tried to, in a blog called Leoanimation.blogspot.com. Like many ghost towns you can still visit it. Recently, I have been wanting to start writing something on Medium, and after several false starts and unwarranted fears of utter ineptitude I remembered the blog. Amongst the tumbleweeds and broken links I unearthed a list I jotted down of 10 things learned in making the short. Maybe I could salvage this decalogue from Blogger Hill and at least repost to Medium? This being the 500th anniversary of the Maestro’s death it seems only appropriate to resurrect something from the dead in honor to him. Told by a younger me, in some ways a wiser me, this acrhiological excavation is myself chiseling out from the strata a more innocent, nieve me. I know now what dedicating myself to a project, that never seemed to end, would mean. What dividens the investment of ten years would payout. Then it was all about just doing it, finish it, honoring a commitment to myself and all those that had helped. But now, after having moved away from that ghost town, forgetting even how to get there, I see the impact of being creative, of completing something and how it can have an influence on your life. It is a facinating relfection. So, ten suggestions from ten years ago, thoughts or learned things from making an animated independent short. Over the next week and a half leading up, incidentally, to Leo’s 567th birthday on April 15th, I’ll dispense with this wisdom for whatever it’s worth. One a day. Maybe it will help you in your own endeavors. Perhaps, some of you have a burning desire to make a film, or write a book, or create that masterpiece. Well, I hope this helps. 1) Those helping you need to get something out of it too. Perhaps one of the most important lessons I have learned working on Leonardo and working with people in general is that everyone needs to get something from the collaboration. This took me some time to figure out. A friend warned me when I started that no one will deliver if you don’t pay them. I thought “Oh no, they will love the project. They will want to do it and besides they’re my friends.” Well he was right to an extent. What I learned is — You, as the main creator, get the film and all the good ( and the bad ) that comes with that, the artists working for you, if they are going to deliver, need something too. This is often thought of in the form of money but truthfully even when people are paid the really good work comes when they are stretching an old muscle, trying something new and/or being challenged. I see this at work all the time and it was true on Your Friend the Rat*. It could be getting a chance to do something they normally wouldn’t. Generally it is really hard to get people to work for nothing, on their off hours without some benefit to them. For example my first editor, Chris Vallance, was an editorial assistant he needed something to learn to cut with so I told him I had this short I was storyboarding if he wanted to he could help me make the reel.† Chris did and I have him to thank for getting this whole thing rolling and he got experience, something strong for his reel and an eternally grateful friend. So find someone who isn’t doing the thing they want to do ( like your not, that maybe why your making your short) and give them a chance to do it. A side note: It is important to realize no one will care as much for the film as you will. Many people have passed through the corridors of Leo, some have helped and some haven’t no matter what good intentions they had. This is to be expected and there is no ill will, you just move on. But you have to be prepared to fill in where others have dropped out or have an alternative plan. For example: I found it hard to get some animators to make multiple changes to their scenes. So I found I would just go in and fix the scenes. I would tell the animator I was doing it of course. They never seemed to mind. 10 YEARS LATER : I’d say this still holds true, younger Jim. I would add that people seem to apply themselves more willingly, are more energized, engaged, when they are motivated by a higher calling. Something bigger then themselves. The project I most recently worked on, Mary Poppins Returns, had that sense to it. All of the creative artists on the film knew we were working on something bigger then each of us individually. We were in it together and no one wanted to let the other person down or be the one who wasn’t giving it their all. This went all the way to the director, Rob Marshal, at the top. This was also true at Pixar in the early days. The studio was hanging on with each film, so the work was about not just the film but the studio as a whole. If there was a problem with a film’s story or production then it was all hands on deck to turn it around. I would imagine this is why those first films kept topping each other. I can’t stress this enough. You have to have a plan for your film. A blueprint. *In 2008 I wrote and directed a short film for Pixar called Your Friend the Rat. Found on the Ratatouille DVD. † a reel refers to a storyreel or animatic. In animation production a storyreel is a series of storyboard drawings projected sequentially like a film with added sound to approximate what the final movie would be like. More on this in the next post. Contriver Hanna Abi-Hanna Animation Class ! ACW Contriver Hanna Abi-Hanna is going to give an amazing lecture and animation class on rubber hose animation at one of our favorite places in the Bay Area - The Walt Disney Family Museum. Here is a link - https://www.waltdisney.org/education/workshops/traditional-animation-cuphead-lead-animator-hanna-abi-hanna Awesome opportunity to learn from a master craftsman! 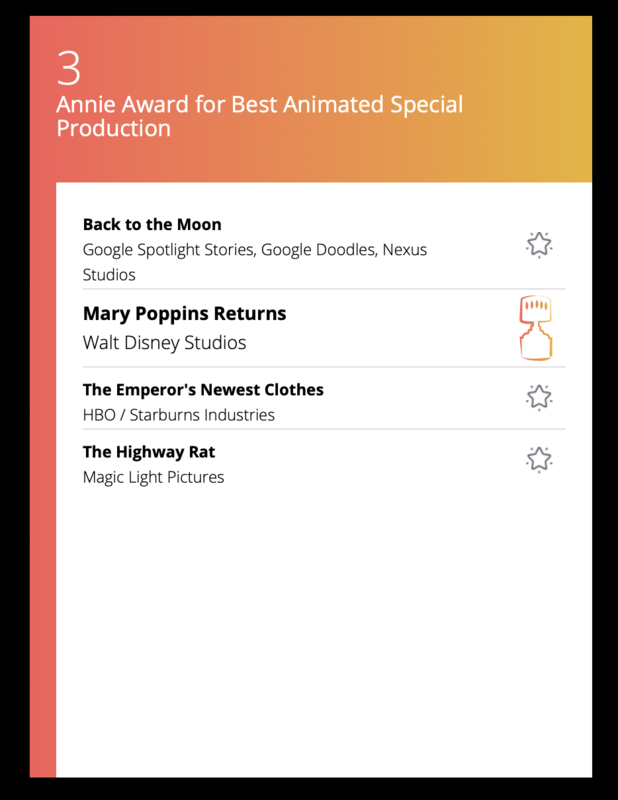 Mary Poppins Returns wins 2 Annies! 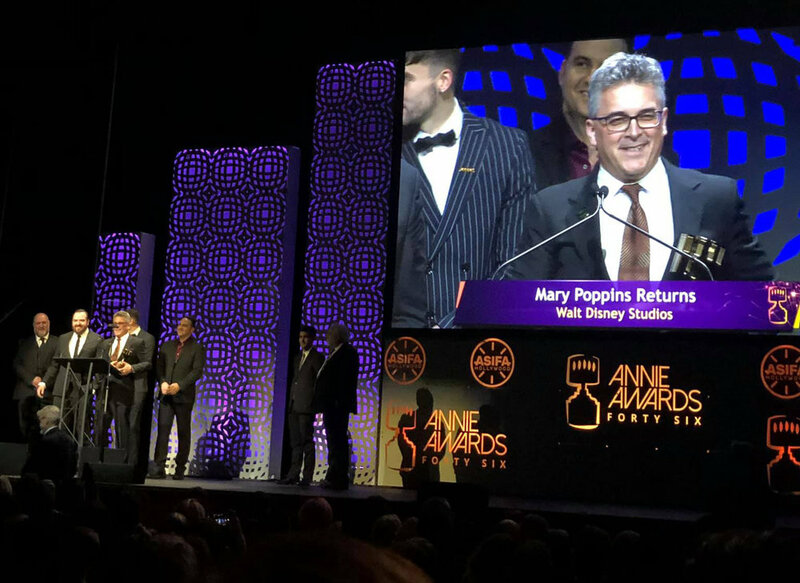 Saturday Mary Poppins Returns took home the award for Best Animated Special Production and Best Character Animation in a Live Action Film. ACW developed the animated sequence up in the Bay Area and Jim continued on to supervise the sequence. It was a tremendously rewarding project and we are so proud and grateful to the entire animation team - from Story to final compositing - for their hard work and dedication. "A Cover is Not the Book" Performed by Emily Blunt, Lin-Manuel Miranda and Company Music by Marc Shaiman Lyrics by Scott Wittman and Marc Shaiman See Mary Poppins Returns in theatres now! Get your tickets today: http://bit.ly/MryPpnsTx #MaryPoppinsReturns soundtrack is available now! For those that don’t know Jim and Aerial Contrivance Workshop developed and storyboarded the animated sequence for Mary Poppins Returns from May of 2016 to April of 2017. 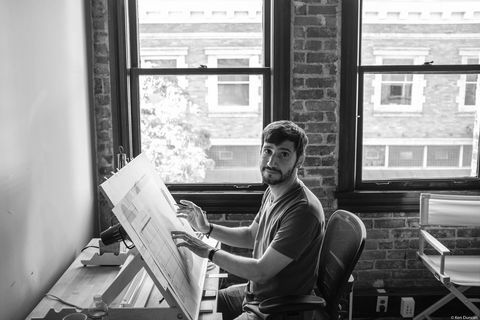 Jim then went on to oversee the animation production of the sequence to its conclusion in July of 2018. The animation, a tour de force of classic 2D drawn animation combined with the latest tools and technology of today was produced at Duncan Studios in Pasadena and Framestore in Montreal. It has garnered some wonderful reviews and notice and all involved are very proud of what was accomplished.